Kelsey Hunter participated in the Mickey Leland Energy Fellowship Program at Los Alamos National Laboratory. Her project involved examining the simultaneous operations of carbon capture, utilization, and storage with enhanced water recovery. Engineering student Kelsey Hunter is no stranger to the U.S. Department of Energy (DOE) laboratory system. Having completed a previous research experience, she applied to the Mickey Leland Energy Fellowship (MLEF) Program knowing she would gain valuable experience within the DOE system. Upon her return to LANL as a Mickey Leland Energy Fellow, she researched alongside Richard Middleton on the Applied Terrestrial, Energy and Atmospheric Modeling (ATEAM) team in the Earth and Environmental Sciences Division. Her project involved investigation of the simultaneous operations of carbon capture, utilization and storage (CCUS) with enhanced water recovery (EWR). CCUS is used to diminish atmospheric carbon dioxide emissions from power plants by injecting the carbon dioxide into deep saline aquifers. However, storage of carbon dioxide within the subsurface increases the reservoir pressure, which can lead to increased cost and risk while decreasing viable storage capacity. The extraction of brine from the same reservoir through EWR can manage pressure in the formation, reduce risks linked to reservoir overpressure and manage the arrangement of carbon dioxide within the reservoir. “With increasing concern on global climate change, CCUS could be a viable option to reduce carbon dioxide created by electricity production and help the United States meet the carbon dioxide reduction goal,” Hunter said. Her project focused on modeling carbon dioxide injection with EWR specifically into the Rock Springs Uplift formation in southwest Wyoming. 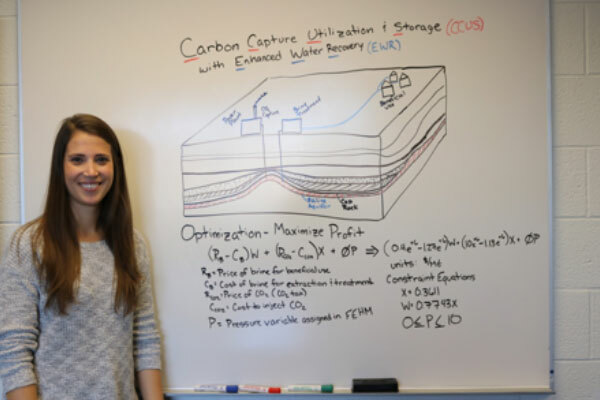 She modeled scenarios based on the quantity and location of the brine extraction wells and analyzed factors such as pressure within the formation, carbon dioxide storage capacity and carbon dioxide saturation. “The goal of this research is to understand how the location and quantities of brine extraction wells can impact the operations of CCUS with EWR and determine if the simultaneous operations can be a cost-effective pressure management strategy,” Hunter said. An abstract and paper detailing her research was accepted by the 13th International Conference on Greenhouse Gas Control Technologies, which took place in Lausanne, Switzerland, in November 2016. It is also expected to appear in Energy Procedia as a conference paper. After completing her master’s degree in civil, environmental and geodetic engineering at The Ohio State University, Hunter hopes to become a researcher and promote sustainable change in the energy sector.